Takes moments to securely install handles. 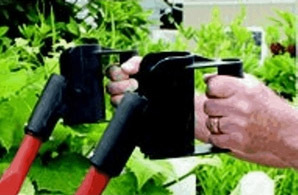 Tubular design of the nylon grip makes the handle comfortable for hands of all sizes. Nylon construction. Pivoting action of the Simply Dump It handles allows user to optimize the momentum of the lift. Increases delivery control of the load by never having to stop to re-position the hands. Helps reduce arm, wrist and back injury.